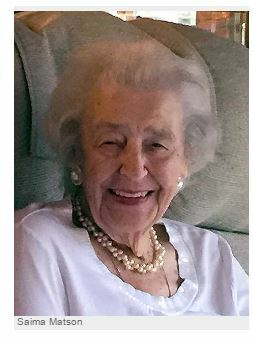 Saima Violet Henio Matson, age 95, passed away peacefully on Wed., June 15, 2016 at her home in Mulino, Ore. She maintained her spirit of independence throughout her 95 years. She was born July 10, 1920 on Meadowbrook Hill in a bathhouse to Senia Halbacka Henio and John E. Henio. She was the oldest of six children. Saima graduated from Molalla High School in 1938 and this year attended her 78th class reunion. She married Orien E. Matson (her Honey) on June 9, 1938 and they were blessed with two wonderful children, Judith Ilona Matson Ramsay and John Matson. Throughout Saima's life she held many unique positions, from being a nanny, working on the family farm, a dietitian at Culver Schools and at the Madras Hospital to name a few. She was always helping others and upon her retirement in Central Oregon, she moved back to Mulino to care for her mother Senia. Saima had a passion for life. She loved dancing and recounted many stories of her dancing at the Liberal Dance Hall. She was the winner of a bathing beauty contest in her early years, a 1937 Princess of the Molalla Buckaroo and an active member of the Buckaroo Royals at her passing. She loved to be part of Molalla's Fourth of July Parade. Her parade wave and smile from the Royal's float will be remembered by us all. Saima, known to many as Si, Nana, and Mom lived a full life not only in age, but by her loving heart. You could always stop by for a cup of coffee, a sweet treat or loving words. One of her well-remembered sayings was: "All roads lead to Meadowbrook!" Her cabana, as she called her home, was a sweet little place that has served many as a favorite spot for quick visits, longer stays, or even a simple honk on the way by. She loved her home and took great pride in it. She called it "her little piece of Heaven", as her yard and home are surrounded with abundant beauty and her favorite things: bright, blooming flowers and bushes; trees she planted when she was young; butterflies, birds and other wildlife; and the beautiful creek she watched every day. Through her love of Mother Nature, she taught many about cultivating flowers, gardens and the Land. She was a teacher of respecting and caring for one another, the world and all living creatures. She touched many lives in her 95 years and radiated a special kind of love. All of us that had the privilege of knowing Saima will miss her, but she will live on in the kindness she shared and the love she gave us. We love you more Nana, sweet dreams. In her blessed life she had to say good bye to many loved ones including her Honey, a grandchild, all of her siblings, and both of her children. Even through difficult times she taught us strength and grace. Family, friends and others whose lives Saima touched, are invited to A Celebration of Saima's Life held at 2:00 pm on July 2, 2016 at the Matson Residence, Mulino, Ore. 97042. In lieu of flowers donations can be made in memory of Saima Violet Matson to the Molalla Adult Center, Meals on Wheels, P. O. Box 797, Molalla, OR 97038.